). The project was built with the latest web technologies and includes HTML5, Google Maps, an integrated drawing tool, as well as multiple browser windows that move around the screen. “The Wilderness Downtown” was inspired by recent developments in modern browsers and was built with Google Chrome in mind. As such, it’s best experienced in Chrome or an up-to-date HTML5-compliant browser. You can launch the project and learn more about it on our Chrome Experiments site at www.chromeexperiments.com/arcadefire. What would a music experience designed specifically for the modern web look like? This is a question we've been playing around with for the last few months. Browsers and web technologies have advanced so rapidly in the last few years that powerful experiences tailored to each unique person in real-time are now a reality. Today we’re excited to launch a musical experience made specifically for the browser. 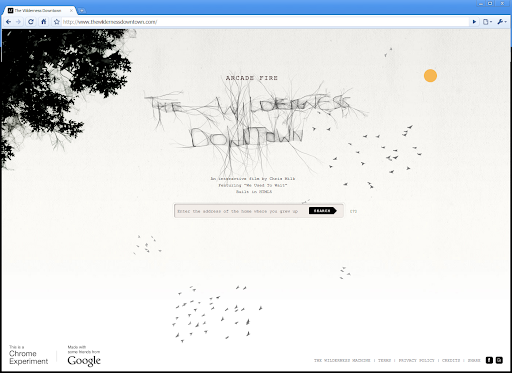 Called “The Wilderness Downtown”, the project was created by writer/director Chris Milk with the band Arcade Fire and Google. Building this project on the web and for the browser allowed us to craft an experience that is not only personalized, but also deeply personal for each viewer. “The Wilderness Downtown” takes you down memory lane through the streets you grew up in. It’s set to Arcade Fire’s new song “We Used to Wait” off their newly released album The Suburbs (which you may be familiar with, especially if you were one of 3.7 million viewers who live-streamed Arcade Fire's concert on YouTube earlier this month). The project was built with the latest web technologies and includes HTML5, Google Maps, an integrated drawing tool, as well as multiple browser windows that move around the screen.